First thing the next day we spent the morning in Juodkrante, a tiny village in the centre of the peninsula. Juodkrante is peaceful and enjoyable, plus it is home to the Hill of Witches, an outdoor sculpture museum located on a hill across the street from the lagoon, right off the main road. 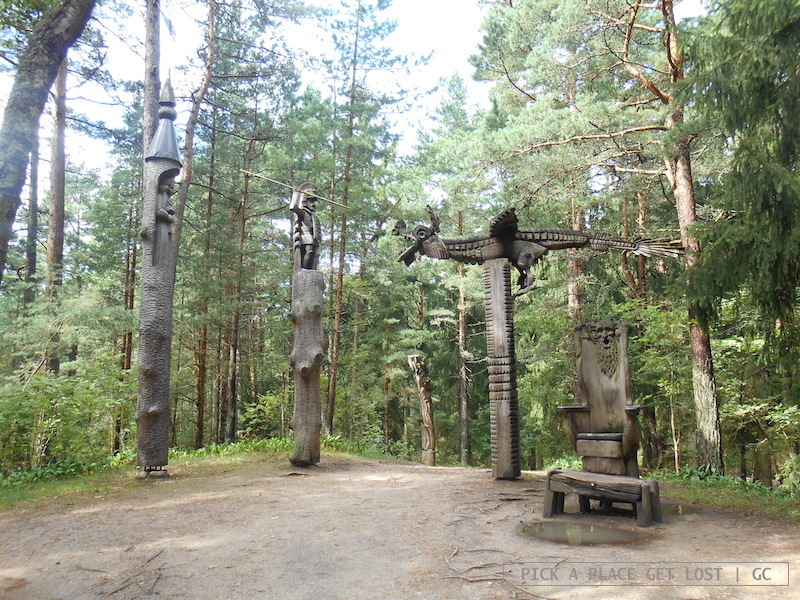 There is a footpath that goes around the perimeter of the hill, which is entirely covered in pine trees (forest, yay) and scattered with the finest wooden sculptures of fairy-tale and human-like creatures, plus animals of all species. We struggled to find the entrance, which I still can’t quite explain, as a massive wooden sculpture sitting on a ‘Hill of Witches’ sign located on the main road points toward the hill. 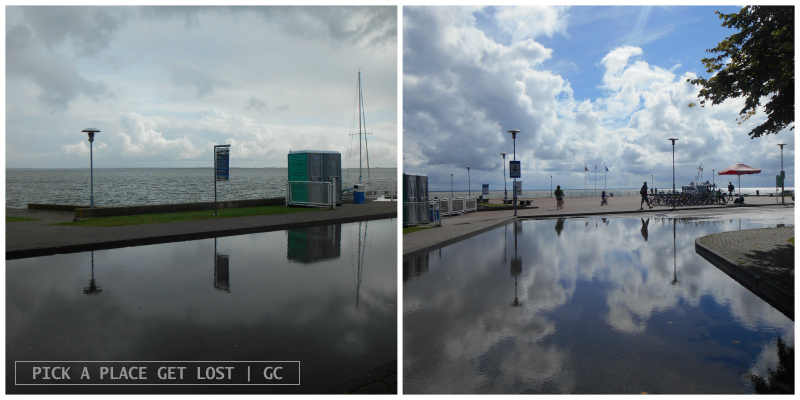 There is no way you can fail to see it while strolling down the footpath on the coast. The best way to finish off our Neringa experience was the walk from Smiltyne to the very tip of the peninsula. The overcast sky was a bit like a cloudless sky on the brightest of days, if compared with the three subsequent heavy storms that had soaked us in in the morning as soon as we’d left the hostel. The wind grew stronger and stronger as we approached the tip. 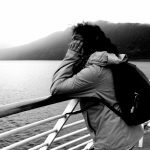 By the time we reached the concrete platform overlooking the sea, right where the lagoon meets the sea, the wind was blowing so hard we could barely hear each other talking. But there was no need to talk. The view had such a powerful feel to it that no extra words were required. 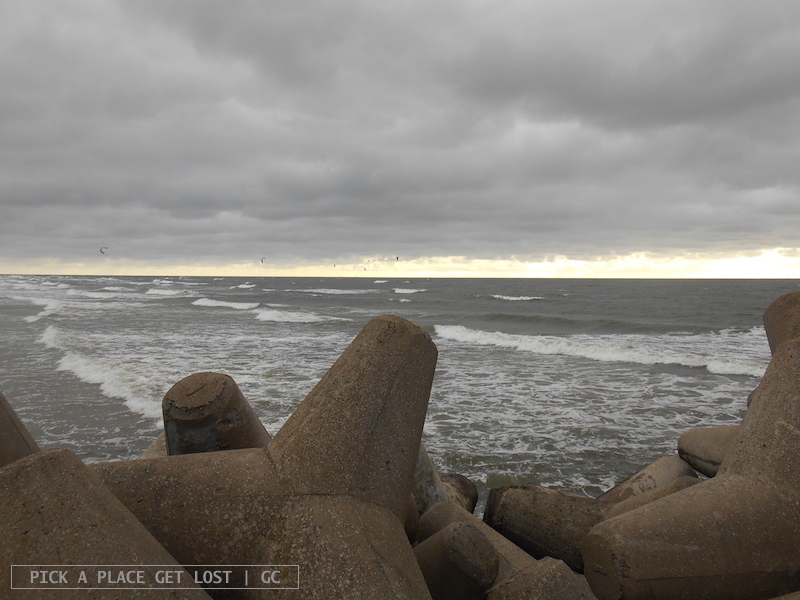 Right next to the concrete blocks flanking the platform, the sandy beach that ran all the way down the western side of the peninsula as far as Kaliningrad (where the Spit is connected to Russian mainland) began. I would positively struggle to find the words to explain how the dark greyish blue of the rough sea matched with the whitish grey of the sky and the most beautiful sand I’ve ever seen. 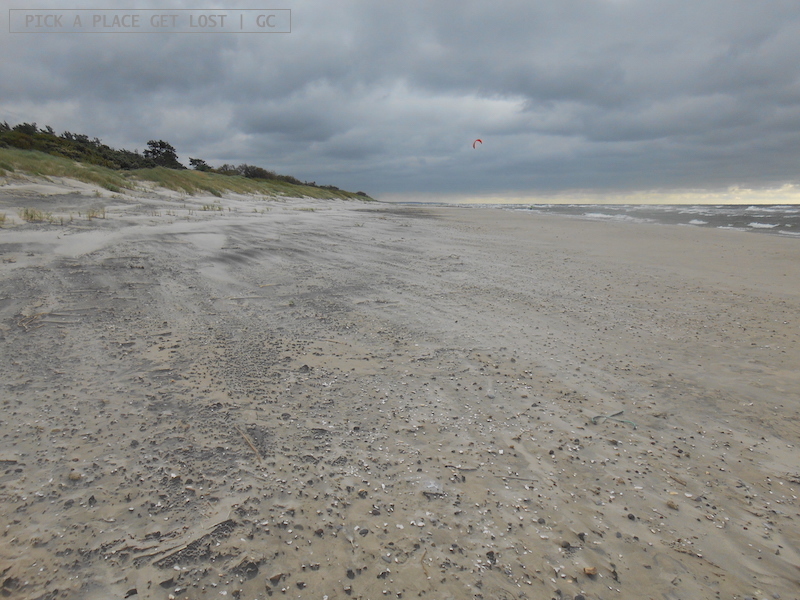 It looked like it had been covered in black dust, so that the wind drew shapes on the beach surface and made every footprint three-dimensional from a distance. Looking at the beach you could also see how the sand gradually gave way to the grass, and then to the forest toward the inland. 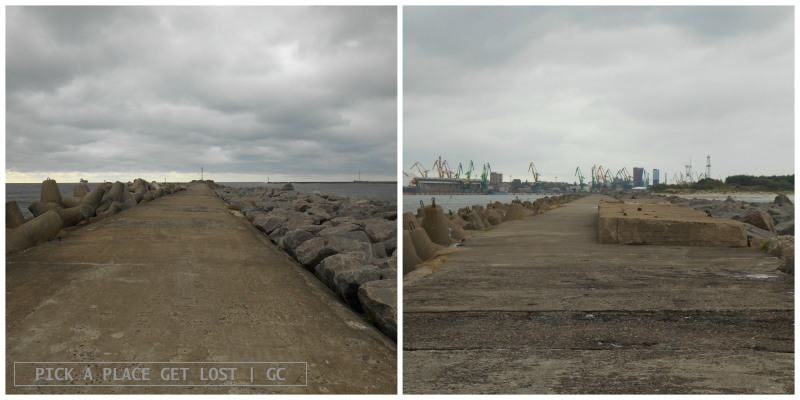 We were eventually able to look away from the beach and return to Klaipeda. The plan was to be back in the hostel quite early and prepare to leave for Kaunas the next morning. 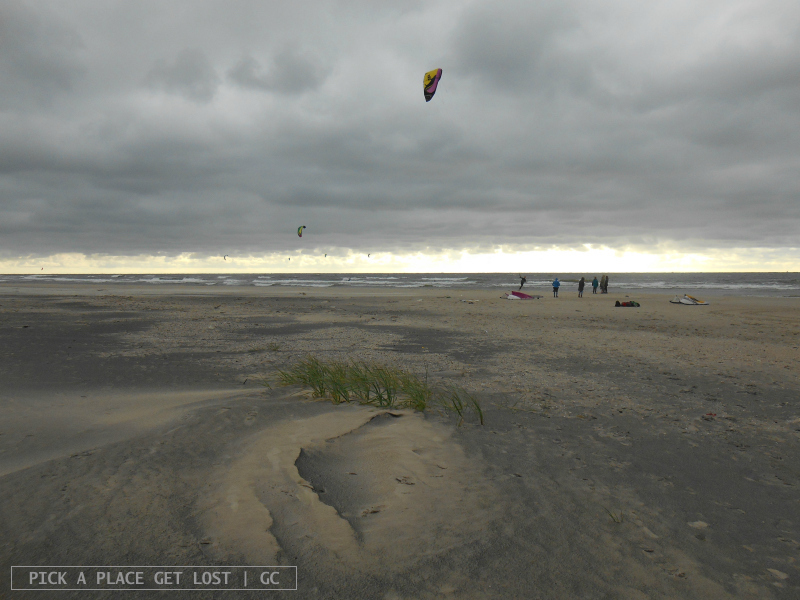 The Curonian Spit is truly one of the most amazing places I’ve ever seen in my life. The forest, the dunes, the beach and the sea strike a perfect balance that results in what can rightfully be described as a perfect display of the forces of nature. Whether it’s sunny or stormy, windy or warm, the peninsula offers a wide range of views, sceneries and landscapes. But don’t worry about the weather: all of the above are equally unique in their own breathtaking way. 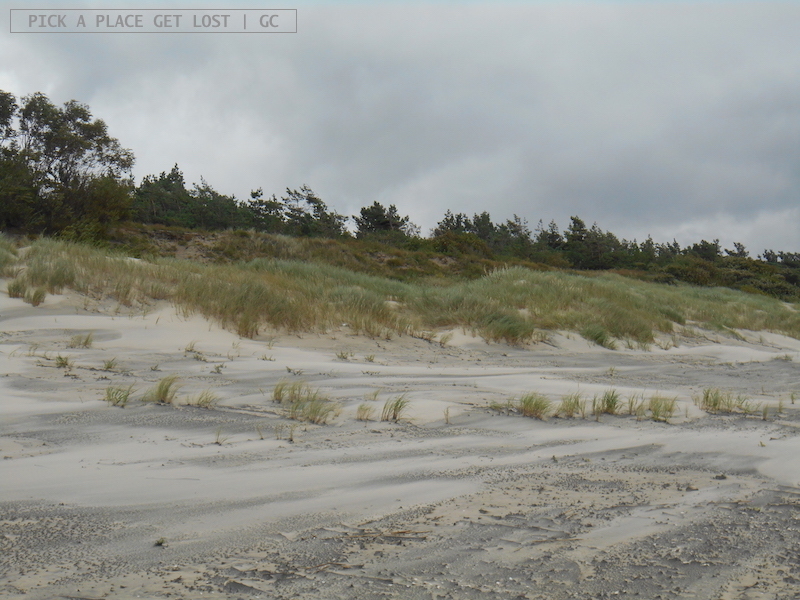 This entry was posted in Lithuania 2016 and tagged collina delle streghe, curonian spit, hill of witches, juodkrante, lithuania, lithuania 2016, lituania, punta della penisola, smiltyne, tip of the peninsula by Giorgia. Bookmark the permalink.